After a year of hard work, a project team of C-Lab, Samsung Electronics’ in-house incubator program, has officially launched their visual aid application for people with low vision: Relumino. Since its release, people with low vision who have tried Relumino – and their friends and families – have offered words of encouragement and appreciation, and suggested ideas for improvement. Coming from real users of this solution, their valued insights will continue to help the developers of Relumino refine their application. One of these users is Robin Spinks, Principal Manager for digital accessibility at the UK’s Royal National Institute of Blind People (RNIB). As a long-time partner and adviser on accessibility for Samsung UK, Robin recently visited Korea to participate in the Torch Relay for Pyeongchang Winter Olympics. Himself a person with low vision, he is also passionate about digital technology. Robin Spinks shares his excitement about and anticipation for changes Relumino will bring to people with visual impairment. Q. Please tell us a little about yourself and the RNIB. RNIB is the UK’s leading charity for blind and partially sighted people. At almost 150 years old, RNIB has a long history of designing and developing solutions to aid independence and mobility for blind people. The organization is also a key player within the World Blind Union (WBU) representing the interests of 285 million blind and low vision persons worldwide. Q. The RNIB and Samsung have been working together for several years. Could you elaborate further about the partnership? RNIB has worked extensively with Samsung to embed accessibility into products. Most recently we have worked with the television division to create an accessible user interface for the Tizen platform. Through the provision of technical guidance, User Interface insight and real-life user testing, a genuine breakthrough in television accessibility has arrived for blind and low vision customers. Q. How would you define accessibility and why is it important? Essentially accessibility is about ease of use by persons of all ability. A product or service which is accessible will be seen as well-designed and fit for purpose by almost all users. Good design is good design no matter what the use, case or operational context. To recognize the importance of accessibility is to recognize the fact that users need change as they move through life. Q. How do you predict Relumino will change the experiences of its users? Relumino is an application which clearly has great potential. Given some additional functionality and features, the app could be massively helpful in situations where a person wishes to spectate at a cultural or sporting event. Or indeed at a theatre performance or live stage show. I’m very excited to see where the application goes next. Q. The RNIB is conducting user tests of Relumino with volunteers who have reduced vision capabilities. What feature of the application do you hope to see developed in the future? A voice assistant and Relumino need to get together! The combination of high quality voice control and artificial intelligence could combine to enable Relumino to deliver some of unique experiences such as the enabling of custom filters across specific sections of the visual field. The possibilities are enormous. Q. When using technology, what is the most important concern for people who are visually impaired? Personalization is without a doubt the paramount consideration. Having the ability to customize fonts, colors and other components of the user interface is critical to ensure an optimized user experience. Voice control is also another key enabler for persons with vision impairment. Q. As an expert in digital accessibility, what do you hope that large corporations like Samsung Electronics keep in mind when developing technologies to enhance the accessibility of the disabled? Customer technologies must keep user needs front and center in all planning and development processes. Accessibility needs to continue to be an integral part of product design, development and sustainability. Regular user testing, product research and inclusive product road mapping will ensure a continuing focus on inclusive design. Q. 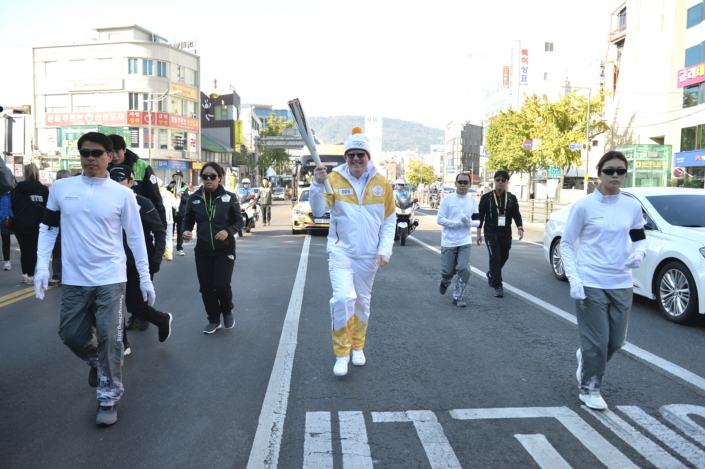 You took part in the Busan leg of the Pyeongchang Winter Olympics Torch Relay with Samsung UK. What did you enjoy most about your trip? This was clearly a once in a lifetime opportunity and I could not have been more excited. I met lots of great people, sampled South Korean culture for the very first time and was part of one of the most amazing global events.